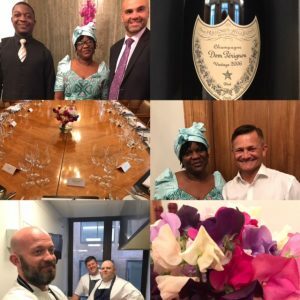 On a lovely evening on the 1st June bartlett mitchell hosted a charity fine dining supper for some of our suppliers. Our aim was to raise enough money to buy an automatic milling machine, for a village in The Gambia, as this would enable the girls in the village to have enough time to attend school. The meal was cooked by our excellent Chef Director, Pete Redman and the two development chefs David Steel and Darryl Young. It was served by our bartlett mitchell team who volunteered for the evening. Yvonne, who was from the Gambia, dressed in national dress for the event, supported by Schbamba and led by George Rodrigues. The food for the event was donated and it was held in very glamorous surroundings, as a generous client allowed us to use their board room. The total raised was an amazing £4555, which was from one evening’s event and a contribution by CEDA. This was enough purchase to the milling machine, plus extra to pay for servicing for a number of years to sustain its use. One of our sponsors Andrew Hunt representing Aduna (an Africa-inspired health food brand and social business) has a special connection with The Gambia and knows the shop where the milling machine will be purchased as he had shopped in there himself. How did bartlett mitchell get so involved? My cousin Gary and his wife were on holiday in The Gambia a number of years ago and got friendly with a local person who asked for sponsorship of their child at school. Not one to hand over just money, Gary went to see the school to pay direct and saw that he could make a difference. 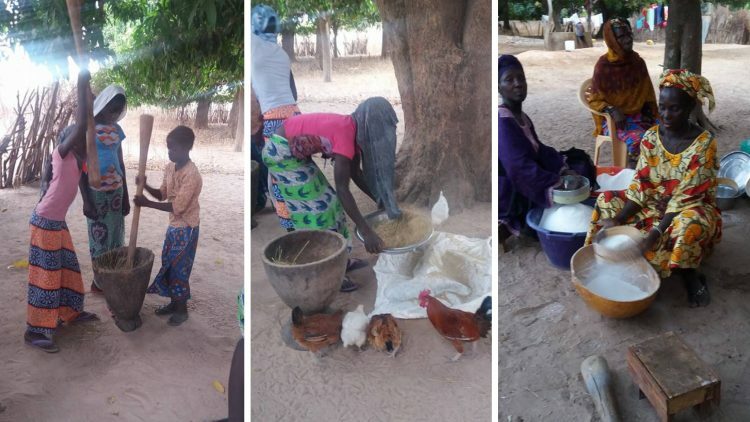 Raising funds with his Rotary Club, Gary visits The Gambia annually, and uses the funds to help this impoverished area and small village within, supporting the community practically. This charity is particularly close to our heart as Gary has helped built a school for the village and one of the classrooms is named after Nancy, my Mum. The classroom was funded by donations received instead of flowers at Nancy’s funeral. This is a charity that we know receives 100% of all monies raised in its name, a real challenge in Africa! Last year Gary sent a note to Wendy asking bartlett mitchell if we would consider raising money for a milling machine for the village. So the note spurred us on to raise the money for the girls of the village and the notes we received from the village elders and mothers’ club showed us that really we can make a difference – we are proud to have done so. Blackpool Gambia School Project was set up in 2003 to help deprived children in The Gambia with their education, We now, with the help of family and friends sponsor 40 children for their education. We have also helped build the first three classrooms for Kotukala Primary School. With funding in 2013 from my Rotary Club, Blackpool Palatine, we used local workmen to make the furniture for the classrooms. In 2014 with the help of funding from Palatine Rotary Club we furnished, tiled, painted and plumbed the new toilets for the school. With the money left over we painted and had shelves made for a new library. We now need to raise funds to build the final 3 classrooms. Another project going on is to support a very poor school in the provinces that Gary discovered this year. It is called Jannehkunda School and has never had any charitable support and it is desperately needed. Gary gave them a small amount of money this year as a bush fire had destroyed a lot of the fencing around their school garden where they grow bananas, cassava and other crops to be able to supplement the very meager food the children get. Without the fence it meant that cattle, sheep and other animals could get in and eat everything. The fence has now been renewed with wire so the crops can now grow again. This is one where Gary will be giving a lot more support to so if you want to help please get in contact with Wendy.